‘There is no escaping it. I love a Bourbon biscuit. Some might argue that it’s not up there with your HobNobs and your chocolate digestive but I do love a good cheap biscuit. A school coffee morning biscuit. It’s there mixing with the custard creams of the world and it is holding its own. I love baking and I love anything where someone has taken the time to bake something but I am also realistic that we don’t always have all the time in the world or the ingredients which is why I love having a few packet mixes stashed in the cupboard ready for me to knock something lovely up if the kids fancy sweet or someone decides to pop round on the hop. Let me introduce you to the easiest and show stopping cheats bake. 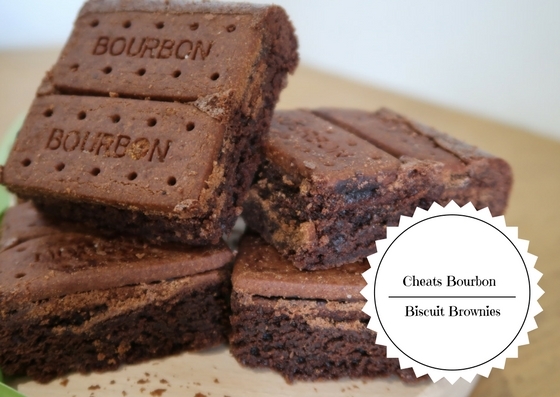 The Cheats Bourbon Biscuit Brownies. Perfect for school cake sales and a weekend cuppa and it’s so easy that even the most novices of bakers can knock these up! It’s the mix of gooey brownie with a crunchie biscuit which makes my Cheats Bourbon Biscuit Brownies to die for!! There is no escaping it. I love a Bourbon biscuit. Some might argue that it’s not up there with your HobNobs and your chocolate digestive but I do love a good cheap biscuit. A school coffee morning biscuit. It’s there mixing with the custard creams of the world and it is holding its own. 1. Start by heating your oven to 180 degrees / 170 degrees fan. 2. Line a brownie tin or a rectangular tin with baking paper. 3. Place the Bourbon biscuits in the bottom of the tin. 4. Make up the brownie mix as per the packets instructions. 5. Spread the brownie mixture over the biscuits. 6. Place into the oven and bake for approx 60 minutes (it takes far longer as the heat has to go through the biscuits before reaching the brownie batter). 7. Remove from the oven and allow to cool thoroughly. 8. Once cooled, turn out onto a board so that the Bourbon biscuits are facing you and cut into either twos or fingers of one biscuit.